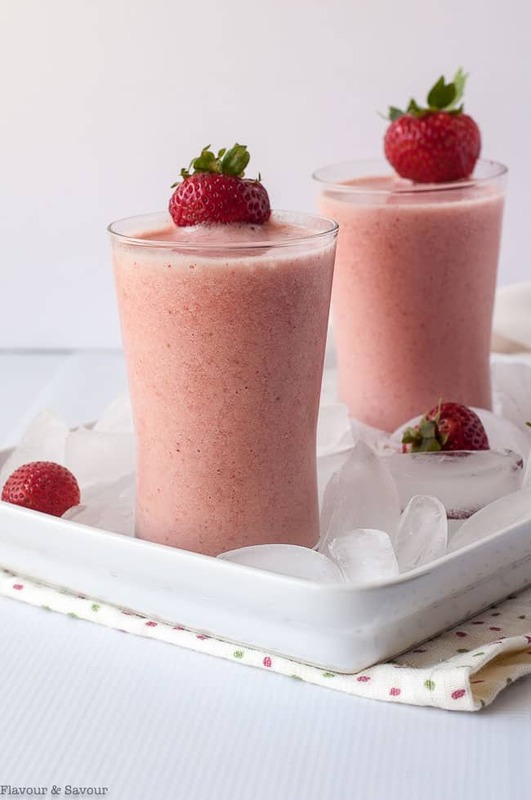 This Strawberry Watermelon Collagen Smoothie is an easy and delicious way to get more collagen into your diet. 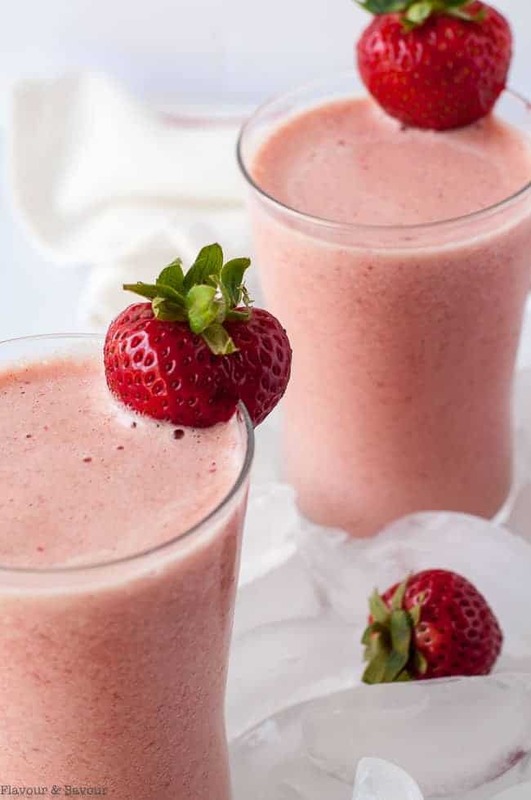 It’s delicious, it’s nutritious, and this four-ingredient Strawberry Watermelon Collagen Smoothie is a recipe you’ll want to add to your weekly routine! One day this summer, we had a refreshing Strawberry Watermelon Smoothie at a small marina in the Gulf Islands. We were so glad to discover that the small snack bar offered several healthy choices instead of the usual sodas and potato chips. It was a welcome drink on a hot day! When we arrived back home, I decided to re-create it. I remembered how much I liked my Orange Collagen Creamsicle Shake, so I added a scoop of collagen to this fruity combination, too. Do you need collagen in your diet? Collagen is a protein in our skin, bones, muscles, bones, nails, hair and in all our body’s connective tissue. Our bodies produce it naturally, but its production slows in our mid-twenties. We may start to lose the elasticity in our skin (hello wrinkles and cellulite), and our body’s ability to repair muscles declines. Adding collagen to your diet in powdered form can help ease joint pain, improve skin elasticity, strengthen brittle nails, and it may even help leaky gut syndrome. However, there are also natural food sources that may help your body produce collagen, too: Try fish, such as wild salmon, cod and tuna, bone broth, eggs, avocados, leafy greens (like spinach, kale and chard), berries, chia, and pumpkin seeds, to name a few. Collagen powder is tasteless, so you can add it to your drinks, yogurt, overnight oats, or even muffins. 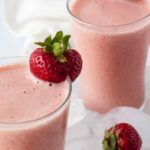 The powdered form is easy to add to a smoothie, and it makes this Strawberry Watermelon Collagen Smoothie a little creamy. I use this brand of organic collagen powder. 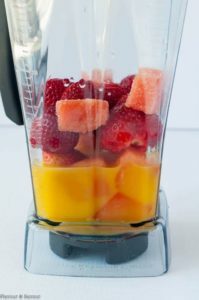 This is a quick and easy smoothie to make, especially if you have orange juice in the fridge and fresh or frozen strawberries and watermelon. I find it handy to freeze cubes of watermelon. I usually have some left over after the grandkids have had their fill and just can’t eat anymore, so I cube it and store it in the freezer to add to smoothies like this one. Give it a try! If you like it, let me know in the comments below, or snap a picture and tag me @flavourandsavour on Instagram. I love to see pics of my recipes that you make! 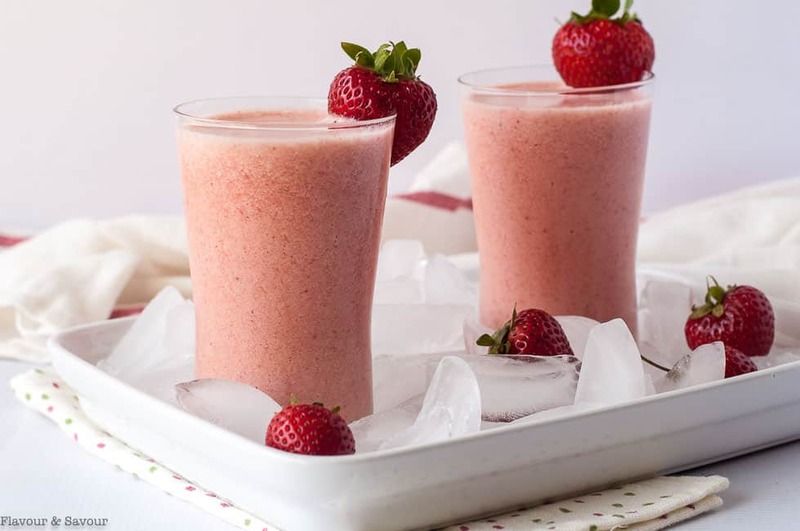 Adding collagen powder to this Strawberry Watermelon Collagen Smoothie is an easy and delicious way to add collagen to your diet. Blend all ingredients in a blender until smooth. Divide equally between 2 glasses and serve. Wow! I didn’t realize you could purchase collagen! I could totally use some! My skin is super dry and my nails go through spurts. Break all at once, grow back, repeat. I totally have to give this a try! Thanks! It works for me! It’s readily available in health food stores. I included a link to the one I use (affiliate link). Hope you find it useful! I’ve been hearing a lot more lately about collagen and I’ve been meaning to try it! This is a really interesting post and that smoothie looks amazing! Yes, there seems to be more and more information about collagen in the media lately. Thanks for commenting. Definitely a delicious way to get more collagen into my diet! This smoothie looks so refreshing! I add it to many of my shakes, but you’re right–this one is particularly refreshing. Thanks for commenting! I am always looking for new smoothies to try and strawberry ones are a favourite in our house. I love strawberry shakes, too. This one with watermelon is so naturally sweet there is no need to add any other sweetener. Thanks for commenting! 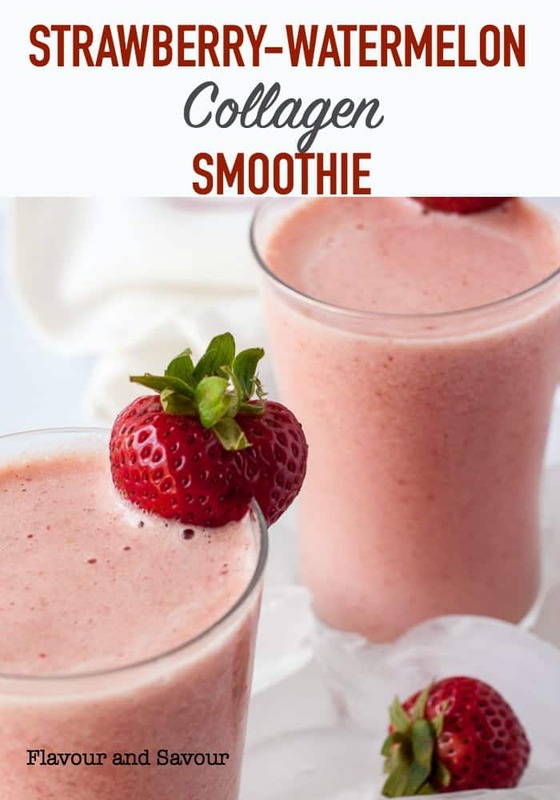 I’ve never thought of adding collagen to a smoothie! Such a great healthy idea! Thanks for sharing! Thanks Iryna, You’re welcome! Hope you get a chance to try it soon. Thanks for commenting. I made this with frozen fruit and it was so refreshing! A great way to get more collagen.